This weekend, I gave a 10-year old girl a dirty look for fouling my niece in a basketball game. I also yelled unsportsmanlike things at the ref….loudly. Look, I’m not PROUD of all my actions and there has been a large part of my life where I’ve told myself “Amber, when you get your sh*t together, you will be worthy of teaching people how to do the same”. Um- spoiler alert- nobody has it together and if they tell you they do, their “Monica closet” isn’t stuffed with things, it’s full of secrets. Maybe it’s my 35 showing, but dude, I’m TIRED. For thirty-five years I have been working tirelessly to attain a completely unrealistic level of perfect and all I ended up with was a whole lot of circles on a hamster wheel of fooling myself. After I fill my mind with comparisons, I find a mirror, get my best “fitness-model pose” ready and CLICK…Instant disappointment, nothing like the images I’ve just scrolled through. In the past, this would throw me into a downward spiral of self-pity and terrible self-talk. Wait, sometimes it still does, because #human. 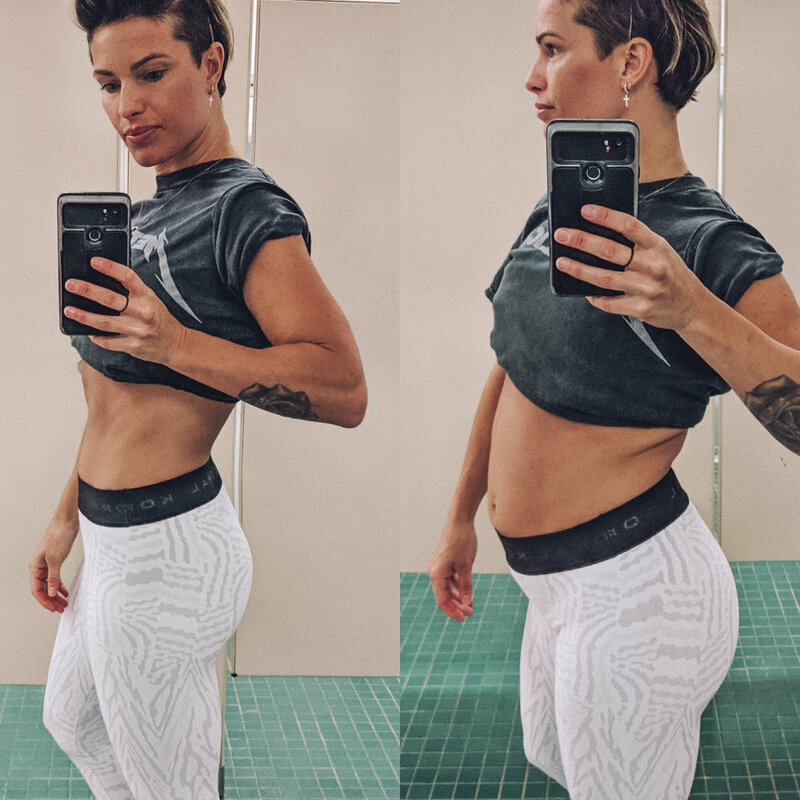 But lately, I’ve been taking the photos that would normally bring me to tears and using them to hopefully break up the insta-feed that’s telling you if you don’t have a six-pack with an easter ham of a booty you’re not beautiful. I have slowly begun to learn that when it comes to being influential, the more relatable and truthful you can be, the more powerful you end up. I fought that for a long time, wanting to ooze this cool factor, only posting photos looking as close to perfect as I could get - I came to a point where I didn’t want anyone to see me in person that followed me because I was so scared I wouldn’t compare to my feed. There’s a reason that instagram models take a kajillion photos in different outfits in different places all on the same day. They post them for the following months so you believe they are always worth watching. The truth is, some of them are sitting on the couch with stains on their shirt, just like you, holding onto 10 extra pounds, just like you, scrolling through instagram feeling bad about themselves…just…like….you. I don’t have my sh*t together. I am a Woman who absolutely loves God with a mouth like a sailor at times. I am a purpose-filled human that still wakes up with a hangover from time to time. I procrastinate (hello, this blog being 3 years late) and I’ve been on the cover of a dozen fitness magazines and I’m still freaking insecure!!! I’m a work in progress, we ALL are and I hope that reading this just frees you to go do something you disqualified yourself for. You will never “arrive” and reach a level required to speak life into other people, we are ALL constantly headed somewhere, the destination is just telling our truth. Please Share this with someone who might need it.